Skyscript.co.uk :: View topic - William Lilly's Ingress chart in Merlinus Anglicus Junior. William Lilly's Ingress chart in Merlinus Anglicus Junior. Posted: Wed Nov 08, 2017 9:18 am Post subject: William Lilly's Ingress chart in Merlinus Anglicus Junior. Lilly cast a chart for the start of 1644, which in the 17th century began at the spring equinox when the Sun made its entry or ingress into the zodiac sign of Aries. It was important to him that his audience follow his astrological reasoning, so his Chart 2 England's ingress chart for 1644 (based on Lilly's original chart for Saturday 9 March at 9.25pm) pamphlet also included a reference horoscopic chart detailing the meaning of each of the twelve astrological houses, and highlighting, in particular, how readers could differentiate between the fortunes of the King and Parliament. The chart is the second modern style circular chart displayed in the article. The problem though as you can see is that this chart still has the Sun in in Pisces! In fact on my software the Sun does not move into Aries until the early hours of Sunday March 10th. Here is the ingress chart I have derived-Old Calendar- for this event. As you can see it gives a completely different chart with Sagittarius rising. So how could this come about? I am assuming Dr Blackledge is too good a scholar to mix up the chart time displayed by Lilly. And equally, Lilly was undoubtably a highly proficient astrologer. So how do we explain this? I have heard Deborah Houlding explain before it can be very hard reproducing Lilly’s horary charts in modern software. This was before the adoption of LMT and local solar time would have been used instead. But this wouldn't explain a divergence this wide which runs to hours not minutes. Another explanation might be related to the astronomical tables Lilly was relying on. Its well known until the end of the 16th century, the most widely used had been the Alphonsine tables, first produced in the 13th century and regularly updated thereafter. These were based on a Ptolemaic, geocentric model of the solar system. Although the Alphonsine tables were not very accurate, for centuries they were the best available so continued to be widely used. Regiomontanus expressed misgivings about both the Alfonsine and the Toledan Tables. He did not live to produce tables of his own, but did issue almanacs and calendars from his press in Nuremberg. The calendars included the times of new and full moons and eclipses for the years 1475-1531; the almanacs gave mean planetary positions, true positions for the sun and moon, and eclipse times for 1475-1506. Both were extremely popular, and an edition of the almanacs was used by Christopher Columbus. However, by the time Lilly was writing in the 1640s he presumably had access to the far more accurate Rudolphine Tables produced by Johannes Kepler which were first printed in 1627. So I am still unclear how to explain this wide divergence between the time given by Lilly and the time that shows up in LMT using modern software. Philosophically, this issue raises the provocative question did Lilly manage to make an accurate and detailed prediction with the wrong ingress chart? I agree with Deborah Houlding that a modern software could not be used with historical charts. I think it was John Addey who said something like, "You're not a good astrologer unless you can get the right information from the wrong chart." A more important question is, "Did Lilly ever cast an accurate chart or perhaps only did so rarely?" Morinus had the same problem and didn't realize it. He also used the Rudolphine tables, and even sang their praises, but they are, certainly by today's standards, but perhaps even earlier, notoriously bad. None of the lunar returns cast in Astrologia Gallica and few of the solar returns and ingresses are correct or even close to correct. i am curious why you say 10:10pm... looks like the table conforms with lillys chart that mark posted either way.. 21:25, + 40 minutes - 10:05pm.. I dont think that was exactly her point. Stating it was difficult is not the same as a prohibition. And in this instance its crucial we make the comparison. Thank you. Ok. So was Lilly using a slightly different but equally inaccurate set of tables for solar longitude? 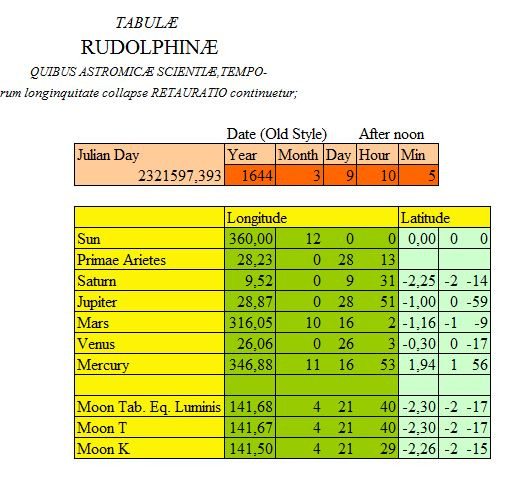 Or can the divergence be explained in large part by the difference between the location used for the Rudolphine tables and local solar time in London? In the case of an ingress there can surely only be one astronomically accurate chart using the tropical zodiac in a specific location. So in a nutshell the modern software is providing us with an accurate chart which it seems Lilly and his contemporaries lacked. Lilly worked with the tools he had available to him and using his outstanding astrological skills he came up with a brilliant analysis of the year ahead. But we now know the actual chart for the ingress of 1644 should have Sagittarius rising not Scorpio. As James noted in his reply below this does seem to give ammunition to the Geoffrey Cornelius divinatory approach to astrology where the ''wrong chart'' can still be highly radical when you have a gifted practitioner who has a consciousness aligned with the higher realm. Morinus had the same problem and didn't realize it. He also used the Rudolphine tables, and even sang their praises, but they are, certainly by today's standards, but perhaps even earlier, notoriously bad. Interesting. The topic of the quality of astronomical tables in traditional sources seldom gets an airing but it does raise an intriguing issue concerning how inaccurate tables can still produce accurate astrology. This certainly applies to Lilly but I am less clear about Morin as his ideas in Astrologia Gallica were never really put to the test in the direct way Lilly's skills were in thousands of horary charts were they? Lilly had to make his living in this way and if his results had been poor he would not have got repeat business or gained the reputation for accuracy amongst not just his clients but in the wider astrological community. Did Morin ever put his reputation on the line in this way? In regards the Rudolphine Tables I have always understood them to be a significant improvement on their predecessors. I think Kepler used Tycho Brahe's research on observing Mars to get more accurate tables. I had understood it was the Alphonsine tables that were were ''notoriously bad'''. At least by 17th century standards. For most stars the Rudolphine tables were accurate to within one arc minute, and included corrective factors for atmospheric refraction. The tables were sufficiently accurate to predict a transit of Mercury observed by Pierre Gassendi in 1631 and a transit of Venus observed by Jeremiah Horrox in 1639. Clearly, though there were significant strides later so that the improvements brought about in these tables can seem limited against the accuracy of modern software. it definitely brings up the geoffrey cornelius (the moment of astrology book) question once again.. Yes James. My thinking exactly! Unfortunately this was not the case. The Rudolphine Tables had less than a quarter of the error in the solar longitudes that the best of the older tables had. But they still had a cyclic error of a little more than 7 minutes of arc, and to make matters worse, the error reached its maximum near the Aries Ingress and the Libra Ingress. Hence when using the Rudolphine Tables, astrologers calculated Aries (and Libra) Ingresses that were about 3 hours off. thus vitiating the house positions and the accidental rulers. But Morin did not know this. The example charts of lunar returns are even worse. In some cases Holden determined where Morin just made some (sloppy) mistakes. In other cases he was closer, but still off due to the tables he used. Morin was a practicing astrologer. Personally, I don't know how much of his practice he put on paper that has not been translated into English or perhaps not found. He makes references to a couple of books that he either wrote and have been lost or promised to write and didn't. Astrology on the Continent was dying out quicker than it did in England, and Morin couldn't find a publisher for AG during his lifetime. It is difficult for anyone to determine how much of his practice could be found in his writings and if it could be found it would be written in either Latin or medieval French. His ideas did not catch on in the greater world largely, in my opinion because astrology was on the way out. Morin's life in astrology has probably been documented, but in French. English translations would be nice to have. Christian Astrology I believe contains only one chart whose outcome was not known prior to publication (Will the Presbytery Stand?). All the others had known outcomes. We trust in Lilly, not because of claims of thousands of charts read, but because the ones he published make perfect sense when worked out according to his rules. The same could be argued for Morin. Like all astrology texts, his examples work beautifully. I understand that in France and Spain Morin's ideas are put into practice by contemporary astrologers as they were in the past in New York City by Zoltan Mason and now by his student Robert Corre (although they worked the outer planets into the system). I would go as far as to claim Morin's ideas have been tested at least as well as Cardano's and other European astrologers in the non-English speaking parts. I will have to cut this short or it will be a small book, but it is my opinion that Morin's ideas do not significantly differ from Lilly's. He quibbles about Cardano's techniques and some of Ptolemy's ideas and he bashes other astrologers, but when we get down to it, his objections are not radical. I would argue they are more developmental. All astrologers start in the same place, but Morin argues with some tweaks here and there, we can get some serious precision that is not available with other astrologers. Yes he developed his own triplicity system, but so did Lilly and Ptolemy and I think Schoener and possibly others. Yes he abandoned the terms and faces, but how often do we use them? Ptolemy might vary more from Valens than Morin does from his predecessors. He did not, as is frequently argued, dismiss universal significators, he just narrowed down the potential depending on the chart. Yes, he would agree, the Moon signifies women in the native's life. But he would say the Moon cannot be all the women in the native's life. Which women were determined by other factors. He deserves better than he's received.